The Volvo V90 is ranked as one of the most popular, highly regarded luxury wagons on the roadway today. There are a number of important reasons why the Volvo V90 is so well-regarded when contrasted with the competition, including its interior features. The interior features of the Volvo V90 include the award-winning Sirius Satellite Radio system. The Sirius Radio system blends functionality with reliability. In this day and age, people find vehicles to be necessary tools to get to work and other important destinations. As such, when cars break down many people need to replace their wheels as quickly as possible. Unfortunately, the vehicle search process can take time and money. Thankfully, there's an easier way. The Volvo Certified Pre-Owned program offers Volvo loving drivers and others quick access to well-vetted and late-model vehicles. The Volvo Certified Pre-Owned vehicle program saves owners time in the form of a 170-point safety and health check. There is a lot to consider when you are shopping for a new vehicle. If you want something that provides you with affordability, reliability and plenty of great features inside and out, then look no further than the new model of the Volvo XC90. Luxury sedans are becoming an increasingly large portion of the automotive industry as drivers continue to see the improvements in them year after year. 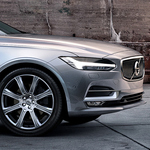 That is why we here at Volvo Cars Escondido are so excited to tell you all about some of the performance features of the 2018 Volvo S90! This luxury sedan kicks out an impressive 250 horsepower, making it incredibly fun to drive on all types of roads. Additionally, drivers can select to drive the vehicle in Eco Mode, which is sure to save you both time at the pump and money in your pocket. Have you recently realized that it's now time to step up your game when it comes to daily transportation? Have you passed by Volvo Cars Escondido and caught a glimpse of the new Volvo XC60? Compact in design yet packed with luxury, the Volvo XC60 may just be the right SUV for you. Once you get seated behind the wheel of the Volvo XC60, you will be greeted with a number of great features. If you like to have knowledge presented to you front and center, then you will appreciate the graphical heads up display.